Our go-to motion detector. 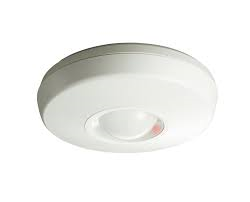 Unlike standard passive infrared (PIR) motion detectors, Dual Technology (Dual Tech) detectors have 2 types of detection device built into them. They incorporate not only a PIR sensor which detects changes in heat patterns in the room but they also use microwave technology, just like a radar. Where invisible beams are projected in the detection area and reflections are analysed as they return to the detector. If a moving mass is detected the microwave sensor is triggered. The beauty of these detectors is that they need both the PIR and the Microwave sensors to trigger before they will activate an alarm which greatly reduces (almost eliminating) false alarms. 360 degree motion detectors are a great way to cover the more awkward spaces such as corridors or storerooms that have shelving all round and no place to mount a standard detector. We can even cover large open rooms such as warehouses by using multiple 360 detectors or by combining them with other detector types. 360 degree detectors are available in PIR and Dual Tech versions.